It’s too bad we aren’t all lucky enough to have the option to store off-season shoes in a wardrobe like this! The rest of us have to come up with something more clever. 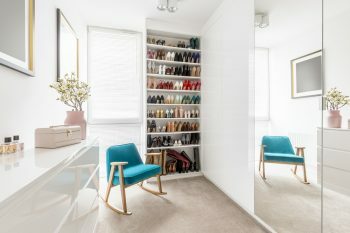 Today’s post is here to help you organize and store off-season shoes, in a way that’s better than just tossing them on the floor of the closet. Though a lot of us do it, it’s not the best way to store any of our shoes. Here are some clever ways to store off-season shoes and boots. The original shoe boxes are fine, but clear boxes make it so much easier to store, organize and see all your shoes at a glance. 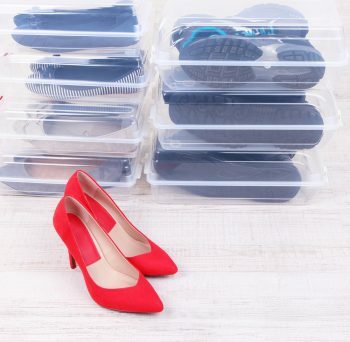 Plus, in case you live where there’s a chance for humidity or moisture getting into your closet, clear plastic boxes are humidity and moisture-proof. Can’t say the same for cardboard! Find something similar to this at Amazon. For those readers who are into recycling, you might try this idea. 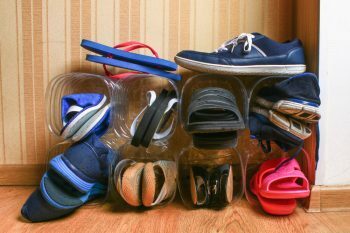 Save your large plastic bottles for handy shoe storage. Just cut away the neck of the bottles so that they are wide open on one end. You can hot glue several together into a cheap and easy shoe rack. It makes a great spot to store off-season shoes such as sandals, flats, and flip flops. When I saw this idea, I couldn’t pass it up! 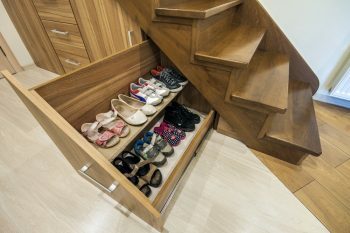 A lot of us have unused storage space under the stairs in our homes. One way to make great use of that space is to install under-the-stairs pull-out cabinets. The small spots nearest the base of the staircase are perfect for something like this! Quite a few pairs of off-season shoes can live here. Do you have space under your beds? An under-bed shoe organizer like this found at Amazon can store up to 10 pairs of off-season shoes. It zips closed so you can be sure no dust or critters will be able to hide out with your shoes. Get it for less than $25! What other ways have you found to store off-season shoes? Please share in the comments!